The flawless crystal of this elegant bottle is used with the subtlety and restraint that often characterizes work in this material. For a further discussion on the development of the use of crystal in the manufacture of snuff bottles, see the footnote to lot 615. Fujian province along the southern coast of China was famous for its crystal, and two of its cities, Zhangzhou and Zhangbu, produced large quantities of crystal carvings as early as the beginning of the eighteenth century. Given the abundance of the natural material, it would have been natural for the local artisans to rise to the challenge of carving the crystal. 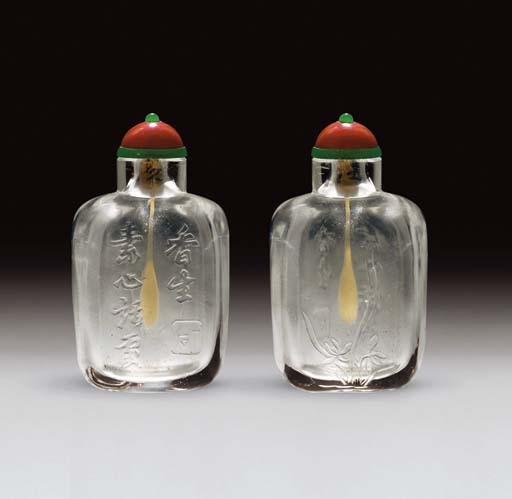 It may be that a school of crystal snuff bottle carvers developed there, but the material would also have been carved elsewhere, such as the Palace workshops, or at Suzhou, and probably other hardstone-carving centers as well. The orchid symbolizes the integrity of the gentleman-scholar, based on the poetry of the Qu Yuan (4th-3rd century BC). During the Yuan dynasty, it was often depicted as an uprooted plant in paintings and works of art as a subtle, silent accusation aimed at the barbarian Mongol conquerors. Here, however, the plant is shown rooted in the soil, depicted with graceful economy by two simple shapes, each with long leaves swaying in the wind. The inscription is divided into two and reads: Xiang sheng ("fragrant blossoming") and Suxin huachu ("a place that allows one speak their mind without inhibition"). The seal reads Yi Shi ("One Stone").